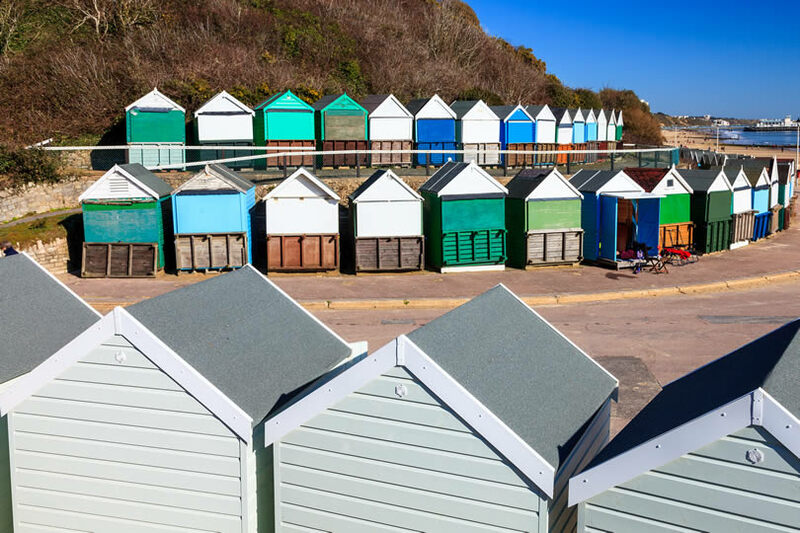 Find your place to stay in the heart of town and the seafront, close to miles of beautiful award-winning sandy beaches, Pavilion and stunning gardens. Home to varied shops, central Bournemouth also offers restaurants, bars, and night clubs. The beautiful cliff top offers striking views across the bay and the award-winning beach. Many properties are set in Victorian townhouses and offer free Wi-Fi and comfortable en suite accommodation. Some offer free car parking as well. Room rates include a full English breakfast. Book the best rates for cheap seafront b&b’s in Bournemouth Dorset UK and save 40% or more. Shopping enthusiasts will love the old-fashioned sweet shops, Castlepoint Shopping Centre and the fashion boutiques on popular Westover Road. You can also walk up the coast and surf the waves at Boscombe Surf Reef. The O2 Academy features many live music concerts. Splashdown Water Park is a 20-minute drive and includes 12 water flumes, an indoor pool and an interactive water play area for under 8s.. Bournemouth is also home to many reasonable priced hotels, located right at the seafront, check them out. Stay in the heart of the town centre and all of the shops and fine restaurants are just a short walk away, as is the beach and the International Centre (BIC), which is one of the leading venues for conferences, exhibitions, shows, entertainment and events in Southern England. Bournemouth Airport is a 20 minute drive, and it is 30 minutes’ drive to the New Forest, or to Poole ferry terminal. Guest houses ideal for business people, couples looking for a romantic weekend, beach holiday, posh hen parties or small groups celebrating a special occasion. Search for the best 5 star and cheapest guest houses for your next beach holiday. 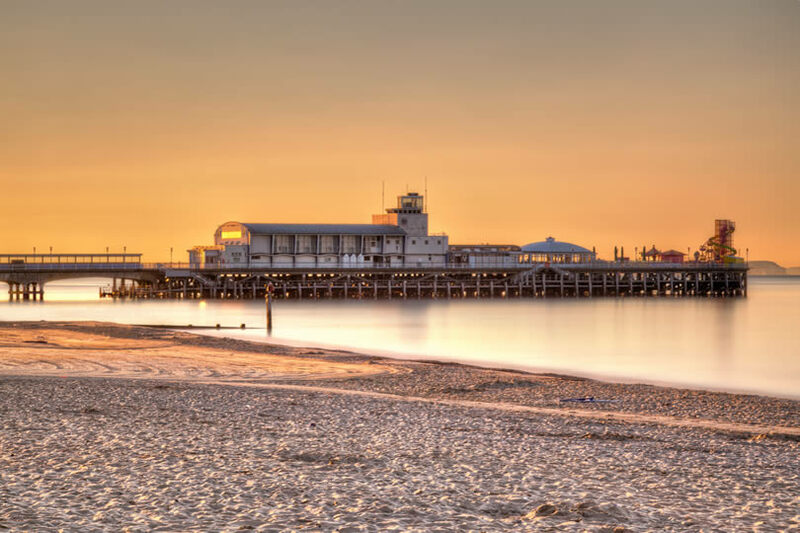 B&B’s with family rooms, free car parking, sea views, pet friendly or that takes dogs, free Wi-Fi internet access, etc.. Full English breakfast is served in the morning, and many of them are within walking distance from the sandy beaches and Bournemouth Pier. Choose and book the cheapest bed and breakfasts in Bournemouth. See our low rates and special deals for budget guest accommodation. Among the very cheaper b&b’s around Bournemouth is Newbury. It’s just a short walk from the sandy beaches located in Bournemouth town centre. The seafront is just a very short walk away and some of the rooms even have a sea view. Another guest accommodation that often offers cheaper prices is Yenton Hotel. This bed and breakfast / hotel is situated on the East Cliff of Bournemouth, close to the cliff top and town centre. Free car parking is available. Check also cheap rates for The Glenbourne. This guest accommodation situated in the Alum Chine area, roughly halfway between Bournemouth and Poole offers very cheap rates. Family-run bed and breakfast just a 5-minute walk from the beach. Find your family and child friendly guest accommodation. Only a few guest houses offer family rooms to accommodate your whole family. Check out inexpensive rates for family friendly guest house Ingledene. It’s family run and situated nearby the Central Railway Station and not far from miles of golden sandy beaches and the Pier. Family rooms can accommodate up to 4 guests. We can help you find the perfect seaside or beachfront guest house with sea views for you. Accommodation close to miles of stunning sandy beaches. A property not far from the beach and town centre is 3 star Tudor Grange Hotel – B&B. This establisment is situated on the East Cliff, by the seafront. Also ideally located 2 mins walk from Bournemouth International Centre (BIC), town centre and the seafront with its golden sandy beach is 4 star Marlins. Situated in a prime position on the popular West Cliff close to the beach. The town is served by 2 railway stations. These are Pokesdown for Boscombe railway station in the East and Bournemouth Railway Station, the primary train hub right in the heart of town. This seaside resort is frequently served by trains from Waterloo train station, trains from Manchester via Birmingham New Street and some trains coming from Nottingham city centre and Newcastle-upon-Tyne central station. The seaside resort town of Bournemouth is located in the south-western part of England, in the county of Dorset facing Poole Bay and the English Channel. London is approximately 100 miles away (see b&b’s and guest houses). The nearest airport is Bournemouth airport, providing regular charter and scheduled flights across Britain and Europe. Alternatively you can fly to nearby Southampton airport SOU, just over 30 miles away from town. Southampton is located in Hampshire. It’s a large and very busy cruise and ferry port town. Lots of hotels and b&b’s are located within easy reach from this port. Beautiful clean sandy beach with some nice bars along the seafront. There are designated beach areas for dogs, surfers and for families. Showers are also available on the edge of the beach. Beach huts can be hired. Private home of Sir Merton Russell-Cotes and his wife Lady Annie. The Victorian architecture and design features are magnificent. BIC is a popular venue where you can see music artists, live bands through to stand up comedians. It is attached to a multi story car park. Aquarium located in West Beach. See lots of under sea creatures, nice attraction for all the family. This famous town is a Bristish coastal and seaside town, and a popular holiday destination on the south coast of England in Dorset. Stroll along seven miles of golden sandy beaches and admire the stunning views. Find your bed and breakfast : stay overnight close to the sandy beaches. Some rooms have splendid sea views.